All of us experience pain. But at the root of our ability to endure pain is the belief that it is not permanent, or at least that its intensity will be dulled with time, or in extreme cases - that death will bring release. However, eternal damnation has no such hope. Its proponents posit that it is a living death, where one is always dying but never dies. While we might sneer at such a prospect, our sneering does not diminish the odds that it might be real. We really don’t know for sure, do we? 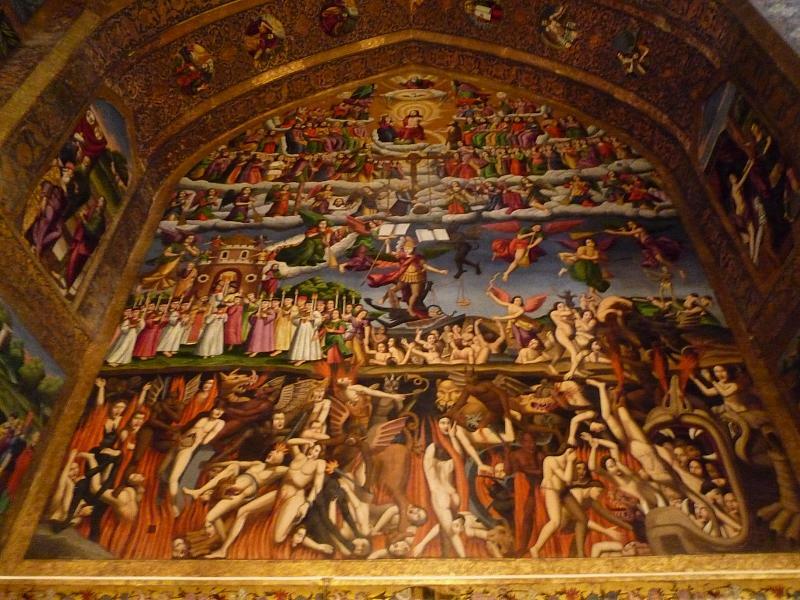 A popular argument against such a horrific eternity is “What sort of a God would make such a place and condemn people to it?” The question is understandable. Both inexplicable pain and the concept of eternal damnation have driven many to atheism or to embrace cyclical religious forms where at least the tortures are not forever. However, whether we choose atheism, Buddhism, or a version of a loving God that does not punish, the possibility of eternal torment, at least for the intelligent inquirer, is diminished not a wit. So let us examine it...just in case. We start with the religions that teach it. While most religious systems hold to some version of a state of post-death torment, most do not hold to its being eternal, i.e. the suffering ends either with the annihilation of the soul or a release from hell after a period of purgation. 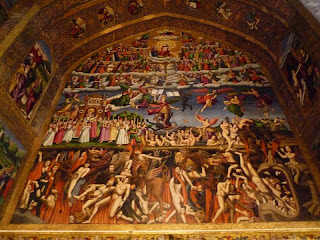 Surprisingly there are only two religions of any consequence that universally teach the existence of a place of of post-death torment to which the damned are sent forever: Christianity and Islam. The claims of the founders. Point 1 is self-explanatory. Islam arose in nearly 600 years after Christianity, and in a land largely infected by a Christian heresy (Nestorianism). As for the second point, it doesn't take much human reason to see that choosing to die for the faith, often rather cruelly, versus killing for it, is a much more difficult choice and thus is an act of faith requiring more notice. Let us then examine the claims of the founders. Whereas Muhammed - and the founders of every other major religion - either claimed to have heard from God or found a way to him, only one founder of a major religion every claimed to BE God: Jesus Christ. And he went to his death without changing his story. But what about that story? Can we really know there was a Jesus Christ? Couldn’t this be a monstrous ruse? After all, what we call the New Testament was written by Christians for Christians, so of course they could have made it up. Plus there are no original copies of the New Testament books. All we have is copies of copies of copies and translations of translations. Couldn’t the whole thing have been concocted and perpetuated in order to enslave centuries of human beings to serve a sinister clerical empire? In response to those who doubt the biblical account, Christian apologists often attempt to make the case for Christ from extra-biblical sources. But the historical record for the Christian Jesus is sparse, and the authenticity of what does exist - such as the account found in the writings of the first century Jewish historian, Josephus - are usually discredited as the later interpolations of zealous Christian copyists. Christian apologists also attempt to make the historical case for Christ by first making a case for the historicity of the Gospels. The case is easy to make. Their is more evidence for the historicity of the Gospels than there is for works of similar or greater age. Example: While few question the authorship of Plato’s Republic, Virgil’s Aeneid, or the works of Homer, there is far more evidence for the authentic authorship of the Gospels than there is for these unquestioned pillars of classical literature. However, if such evidence would suffice then we would not have unbelievers, and yet we do. So, for our purposes, the historical evidence for Christ will need to be made from non-Christian historical sources already accepted as authentic. We are still in the afterglow of the Epiphany. Christ is born (Christmas); now He must be revealed and adored for Who He is (Epiphany). The liturgy of these Sundays after Epiphany spell this out for us. 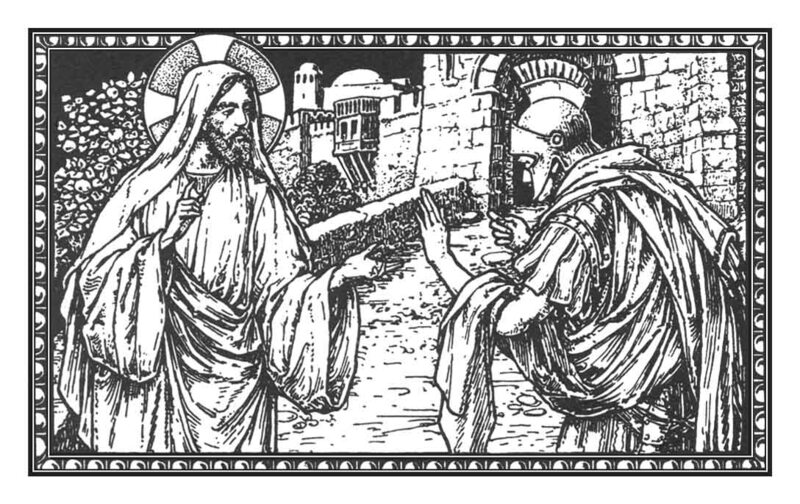 He showed Who He is at the miracle at Cana; He does so again in today's Gospel in the healing of two rejects : the leper and the pagan's servant. There are some KEY WORDS that are repeated over and over in this Sunday's liturgy. God's HAND, WORD, MOUTH, NAME, GLORY. This is what God does. Man's JOY, AWE, GODLY FEAR, ADORATION in seeing and hearing what God does. This is man's response. INTROIT : You see how we still hear echoes of the Epiphany, when Wise Men adored the Christ Child. "Adore God...." Sion heard; heard what? The Good News, preached by the Lord in word and deed. Who is Sion? The Church. The Church is the New Chosen People. The Church rejoices in the saving works of God. "The Lord reigneth..." Over what? Over sin (the leper) and death (the sick servant). Christ forgives, and overthrows sin, represented by the leper. Christ heals, and overthrows sickness and death, represented by the servant. Behind both sin and death is Satan. Christ has overthrown the kingdom of Satan. Therefore we rejoice. The Church comes from all the world, not just the Jews. "Let the many islands be glad." This points to the universality of God's salvation (Epiphany; Wise Men from foreign lands). Even the smallest islands (not just the big, important nations) - like Guam - are included in God's salvation and have reason to rejoice. COLLECT : "Mercifully look upon our infirmity..." In the Gospel, Christ looked mercifully upon two people down with infirmities. He healed both of them, by means of His human hand, full of divine power. Christ is here in Mass; His blessed humanity in the Body and the Blood. 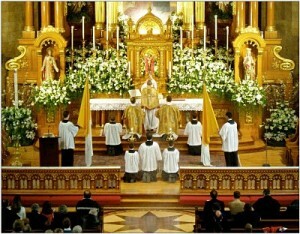 His grace flows through the material and spiritual Rites of the sacraments. In Confession, He heals the spiritually sick (lepers). In the Eucharist, He feeds and nourishes the physically and spiritually weak. EPISTLE : Looking at the entire liturgy of the day, we see that the Church (Sion) is called to rejoice in God's salvation. 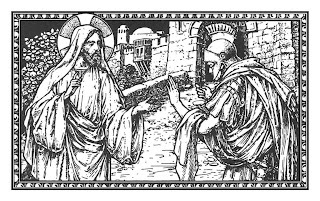 In the Epistle, we are taught by Saint Paul how to behave as members of the Church : being charitable towards all; doing good to those who do evil to us. GRADUAL / ALLELUIA : Echoes of Epiphany : "The Gentiles shall fear; all the kings of the earth..." The Church is made up of Jew and Gentile. The Church is Sion, and God has built up the Church. We see God's glory in the life of the Church - in her sacraments and doctrine, in the life of her children, priests, religious, missionaries, devout families, martyrs and so on. In the Alleluia, the theme of joy and universal salvation is repeated. GOSPEL : The leper is a symbol of sin. Sin is a disfigurement; it ruins the beauty of the soul, which God created and gave such god-like powers such as memory, intellect and will. "Let us make man in our image," God said in Genesis. God looked at man and said, "It is very good." Leprosy starts small and grows over time; it kills after a long process. Sin also begins quietly in the hidden, inner recesses of the heart. Sin grows and worsens. It kills our friendship with God the moment we give in and choose to sin. But sin's ultimate death is at the end of life when one dies in that state, having lost all opportunity to repent and be saved. The centurion is not a Jew. He is therefore also a pagan; according to the Jews, he is no sharer in salvation; God has nothing to do with the pagan. And yet Christ cures this pagan's servant because of his faith, which the Jews did not have in Christ. The adoration of the Wise Men from foreign lands is continued in the faith which this foreigner has in Christ. OFFERTORY : Christ is the Good News. We do not have to die anymore; in the second, worse death, which is that of the soul. We shall all suffer the first death, which is harmless for the righteous. This first death, for those saved by God, is actually a blessing (Saint Francis called it Sister Death), by which the soul of the righteous goes to the Father. This victory over death was won by the hand of the Lord, which was nailed to the cross. Let us therefore rejoice and "declare the works of the Lord." Our job is to proclaim Christ to others. SECRET : "Sanctify the bodies." It is not just our souls that are sanctified. Even our bodies must be made holy. We sin (usually) with our bodies. Even our immaterial thoughts, sometimes sinful, are produced with the help of the body. Our bodies are partners with our souls in either good or bad, and will be partners with the soul in either reward or punishment. A "holy body" is one that refrains from sin; one that does works of righteousness; one that suffers in sacrifice; one that is sanctified by prayer and the sacraments. Remember that God Himself took on a human body just like yours. It is for this reason that we pay such respect to the bodies of the deceased; why we venerate relics of the saints (usually a part of their body, or clothing that touched their bodies); why we need to treat our bodies well as temples of the Holy Ghost. The body you have right now will one day (God willing) be in heaven! COMMUNION : "All wondered..." Christ amazed the people. They were at a loss to explain it all. They were forced to ponder and think. Mary is the model of that. Though full of faith and one with God in her will, she nonetheless had to witness for herself the wonders of her Son. This is contemplation. To contemplate is to look at something with wonder and awe. Doing this changes us. We become a part of what we are looking at. We need to do a lot more of this, for our own benefit. Sit before the Blessed Sacrament and think about God's amazing works and the amazing nature of God revealed in His works. Just reflecting on God's beauty and wonder will change us more and more into His likeness. POST-COMMUNION : Where are the fruits? This is what Christ will be looking for on Judgment Day. A tree without fruits will be cut down. We will bear fruit when we die (to our own wills; our own ways). "Unless a grain fall to the ground and die..." Let us nail ourselves to the cross with Jesus in Mass. It is in dying that we are re-born. Self-will says "take revenge, fight back, lie, cheat, slander." God's will says "forgive, bless, sacrifice, do good." Christ cannot be King in our hearts if we are sitting on that throne ourselves. A few months ago I was asked to give a talk entitled “Why I am a Catholic”. While preparing the talk I thought of my many relatives and friends who have left the Church. While some have left for emotional reasons (they’re mad at somebody), and others for what I will just call “conjugal irregularities”, I believe most have left or dropped out for wont of a reasoned explanation to stay. I have often ask such folks if there is a particular reason why they left and have they ever considered returning. While some were simply indifferent, most just had unanswered questions. What’s amazing is how simple those questions are and - when those questions are engaged in a charitable way - how willing many are to return to the Church. What is also amazing is how so much pain could be avoided by simply knowing how to engage such questions and where to look for the answers. Parents whose children no longer practice the Faith are particularly pained - particularly when grandchildren are involved. Parents who have grudgingly accepted the religious waywardness of their own children often find it more difficult to accept their grandchildren being raised in a different faith or no faith at all. It is probably hearing other parents share their distress that first caused me to develop a short “Reason to be Catholic” for my own children. But rather than wait to be confronted with their doubts and questions, I opted for a pre-emptive catechetical strike to not only help them fend off challenges to the Faith, but to assist them in engaging those challenges so that they might be able to keep others from leaving the faith or even bring new souls to it. In working to restate this “catechesis” for publication, I have augmented it for “big people” as a sort of mini “Case for Catholicism”, but it can be scaled up or down to address the desired audience in case you would like to use it or portions of it. Let's begin. My “Case for Catholicism” begins with a certainty, the only real certainty: death. I will die. You will die. For all of us there is one, single, absolute, glaring, uncompromising certainty: we will die. On this, theist and atheist, must agree. So we begin at the end: death. Upon death there are two possibilities: there is either an afterlife or there isn’t. It’s simply a 50/50 proposition. Atheists may argue against life after death but the argument does not change the odds. Given the 50% chance that one may live on after death in some form, one may choose to consider the possible nature of that form, or choose not to. Given the many possible proposals of the nature of the afterlife, it would behoove us to consider those possibilities, especially since some of the possibilities are not that pleasant. Our prospects in the afterlife are many: We could live on as a cow. We could inhabit a tree. We could haunt a house. We could wander the universe. We could rule our own planet (Mormon). We might dwell in Paradise with 72 virgins (Islam). We could become a star, an angel, Elvis... There are as many proposals as there are belief systems, and then some! However, there is one prospect that we must take more seriously than any other: the possibility of eternal damnation. The possibility of a living, conscious, state of eternal torment of body and soul is so frighteningly horrific that even the slightest sliver of a chance of it possibly being real demands consideration of the greatest gravity. There is a 50/50 possibility of the afterlife. There are several possibilities to consider. The possibility of eternal torment is too frightening to ignore. Go here for Part 2.